Crunches are indeed one of the renowned workout techniques and mostly it is performed by many of the people to get their belly fat reduced. Apart from that, crunches can also be considered as one of the important workout tactics when it comes to the case of various warm up inclusions. When compared with some of the other basic exercises, such as lunges, squats, crunches are actually a bit difficult to practice, however these are to be included in the exercise routine keeping all the benefits of this exercise in mind. There are actually numerous varieties of exercises that are available and all the exercises are actually special in their own way. In this regard, this article gets to feature some of the amazing crucch workouts that can aid a lot in improving your overall fitness levels and therefore, it is highly recommended by all the people to take a note of these workouts and get to include them in the exercise routine on the whole. This is indeed one of the most basic type of crunches that you’ll ever get to perform and the method of performing this exercise is also quite simple when it’s actually compared with that of many of the other complicated ones. The first step that is involved in performing this exercise is simple to lie on the floor with your hands on the back of your head as depicted in the figure whereas in the second step all you’ve to do is to lift your entire body in such a way that your abdomen gets to handle all the pressure during this step. This method can be highly helpful in reducing the fat that is present in the abdomen region and it can also be helpful to those who desire a lot about their abs. This particular exercise a swiss ball and you need this gym ball to perform crunches on it. This actually sounds weird, but the method of performing this exercise is quite simple. A swiss ball is nothing but a gym ball which is made of a soft and elastic material and this particular ball is included in many of the gyms owing to its fitness benefits. One of the best exercises that can be performed with the help of this pezzi ball is actually the form of raised crunches and this exercise is actually quite similar to that of the previous exercise with only a little difference. 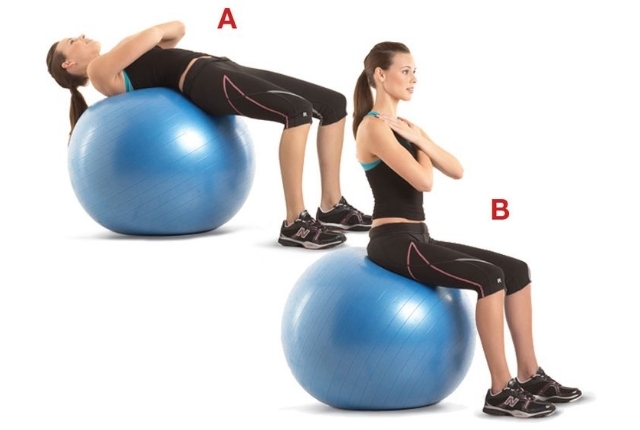 In this exercise, all one has to do is to lie on the ball as shown in the figure and then get to perform the usual crunches. This process has to be repeated continuously and the count depends on the fitness and also the stamina levels of the person. Another important thing is that you’ve to always hold on your balance on the swiss ball, else it can trigger many of the troublesome situations as well. Therefore it is highly recommended for all the people having a swiss ball and intended to reduce their belly fat completely. Another formidable way of crunching but it has many effective outcomes when compared with the other two workouts. In this exercise, all you’ve to do is nothing but to lie on the ground with your knees popped up as depicted in the figure. Also get to mold your hands upwards and it has to be in a similar way shown. After that, get to perform the crunches in an usual manner and this exercise is recommended to all the people who are a lot worried about their belly fat and their fitness levels. This particular workout is quite similar to that of the initially mentioned one but there’s only a little difference that is involved. In the first step of the exercise, get to shape your legs in the way as shown in the figure and make sure that you actually lock your legs in a firm manner. After that , get to perform the workout in an efficient manner where all you’ve to do is to simply workout in the usual way of crunching. The locking of legs is quite important as it can get to double the pressure on the abdominal muscles which can easily get to reduce the fat that is accumulated on the belly area. This is an unconventional way of crunching where all one has to do is nothing but to take the posture as depicted where one of the arms is rested and you’ve to lean sideways. After taking the position as explained, lift your body to perform ab crunches which is all necessary at that instant. The name itself suggests that this p[articular exercise in in contrast when compared with that of the regular ab crunches. The usual way of crunching can get to reduce your upper body fat but this reverse crunching assist you a lot in thrashing out the lower body fat as well. The first step in this workout is that you’ve to fold your knees and then bring them near your chest. After that, rise your legs keeping your body in the rest position and this process has to be repeated continuously for some better benefits on the whole. The method of performing this particular exercise is quite simple where all you’ve to do is nothing but to lift your legs and hold and hold them in a way as shown in the figure. After that, get to indulge in the usual way of crunching where this process can be highly beneficial in toning your ab muscles as well as assist a lot in reducing the body fat levels as well. Lie on the floor mat initially and then get to perform the crunches by moving left and right side continuously. This can be drafted as the best way of performing twisted crunches.